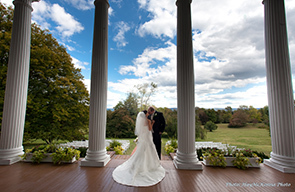 Visit our 1811 estate nestled in the Shenandoah Valley on 60 immaculate acres. Once owned by U.S. Senator Harry Byrd, Rosemont has served as a respite for presidents and celebrities. Historic Rosemont Springs - New in 2019! We're excited to announce our new venue - Historic Rosemont Springs. This elegant, Amish-built barn features a stone fireplace, garden terrace and waterfall. Add a Spark of Rosemont Radiance to your Occasion! Dreaming of a horse drawn carriage? A sparkler send away? Or even a sky full of fireworks? Rosemont can make all your wildest wedding hopes come true! 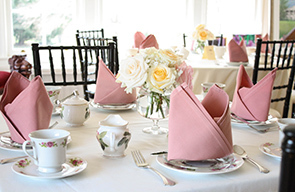 Photography by "Lynn Prescott Photography"
Relax at Rosemont during one of our wonderful three-course teas. Check the schedule to see our upcoming dates. Plan your next overnight getaway to Rosemont, and enjoy a respite from the pressures of the day. 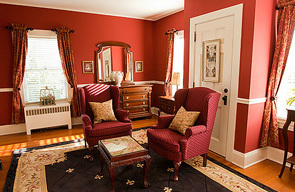 Call 540-955-2834 to learn more about our special amenities such as spa services, vineyard passes, and more. 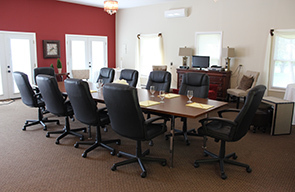 Rosemont is the ideal location for your next off-site corporate event.